The Frederick R. Weisman of Art at Pepperdine University will host Back to Basics: Selections from the Frederick R. Weisman Art Foundation, an exhibition of modern and contemporary art, from Monday, Aug. 31, to Sunday, Dec. 6, 2015. A reception to meet the artists will take place Saturday, Sept. 19, from 6 to 8 PM at the museum's Malibu location. 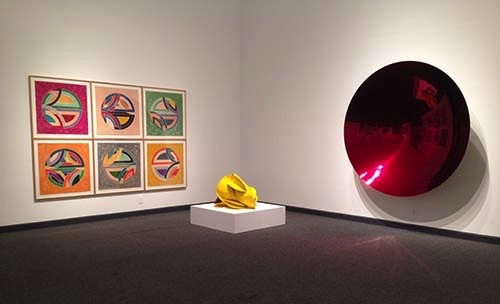 Featuring works by artists such as Josef Albers, Anish Kapoor, Donald Judd, Sol LeWitt, and Frank Stella, the exhibition features modern and contemporary art that uses basic shapes and fundamental forms to create riveting visual experiences. Back to Basics explores the range of geometric abstraction from 1960s Colorfield painting, Hard-Edge, and Minimalism to the present. Today, this style has become an essential part of our everyday world and influences all aspects of contemporary design—from clothing to magazines to websites. But this style in art was originally shocking and revolutionary. The artists who pioneered geometric abstraction advanced a new way of seeing—one based on basic forms, powerful shapes, and essential colors. Their goal was to reach something vital and fundamental in human experience. This exhibition features 46 large-scale works of art ranging in date from 1958 to 2014. It includes works by the great names in postwar art—Albers, Judd, LeWitt, Kenneth Noland, and Ellsworth Kelly—and by a new, younger generation of artists—Kapoor, Tim Bavington, and Isaac Brest, to name but a few. These works present half a century of artists investigating the timeless power of simplicity. As the Bauhaus artist Paul Klee once said, “Art does not reproduce the visible; rather, it makes visible.” The artists in this stunning exhibition show that geometry is a creative tool that artists can use to explore the realms of ideas and perception, of seeing and knowing. Back to Basics celebrates the artistic desire to see and discover more beautiful than everyday reality.Back to Basics was curated by Billie Milam Weisman, director of the Frederick R. Weisman Art Foundation, and is supported by the Frederick R. Weisman Art Foundation. For more information about this exhibit, visit the Center for the Arts website.